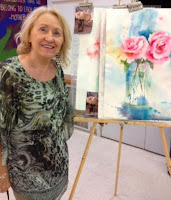 Watercolor artist, Teri Gammalo, uniquely communicates her feelings about life's joys into her artwork. In fact, people often express that her paintings are alive with color and compel them to explore the meaning of her paintings. Teri's expresses her love for painting, stating, "I am happiest when I am creating and feel my paintings are a reflection of my love for life, children and nature." Teri's artistic statement is bold and dramatic. Her award-winning work has been juried into many local and national exhibits, including National Watercolor Society, Watercolor West, Made in California and Irvine Fine Art Center. She is a member of many local and national art societies, including the National Watercolor Society.